A key vote expected to have taken place on Friday at a meeting of creditors of Harlequin Property (SVG), the bankrupt Caribbean resort developer, has now been pushed back to 10 April. The appointment of KPMG as bankruptcy trustee for the HP (SVG) estate was, as expected, confirmed in the meeting. The vote that has yet to take place is to appoint five “inspectors” who will be responsible for deciding the fate of the development – which basically means they will be the ones to decide whether it is liquidated, as certain parties to the matter are keen to see happen, or whether an alternative plan – which it is claimed would see the investors, who currently are unsecured creditors in the main, given ownership of the debt-laden development, in hopes of reviving it – would be given the go-ahead. 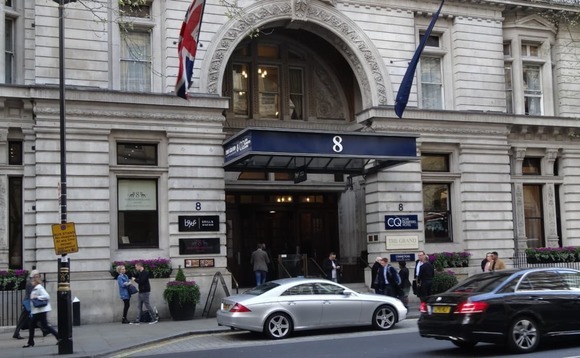 Around 200 of these investors attended the Harlequin Property meeting in London, which was held at 8 Northumberland Avenue, in Westminster (pictured), and which was also attended by Harlequin chairman and founder Dave Ames. As reported, Ames has put together a plan to revive the business on behalf of its investors, an undisclosed but large number of whom he says are behind it. The plan is opposed, in favour of liquidation, by such other parties as the UK’s Financial Services Compensation Scheme and KPMG, on grounds that it was unlikely to succeed. Interviewed after the meeting, Ames said he was pleased that the vote had been postponed, because it showed, he said, that the views of Harlequin’s investors are beginning to be heard. According to Ames, most of those attending Friday’s meeting in London were cash investors in HP (SVG), who stand to lose their entire investments if the business is liquidated, and who are therefore keen to see the alternative option explored. The Harlequin saga began more than a decade ago, when Harlequin broke ground on its St Vincent and the Grenadines flagship resort development, Buccament Bay, with thousands of mainly UK residents buying off-plan properties at the suggestion of their financial advisers. At first it seemed destined to become a new Caribbean favourite among British sun-lovers, but it soon ran into trouble, and ended up in the courts. The option to try to revive the business, which is partially built but closed in December when it ran out of money to keep going, came about after the UK’s Court of Appeal in January turned down a request by the UK accountancy, Wilkins Kennedy, to appeal a High Court judgment last December, which ordered it to pay US$11.5m (£9.14m) to Harlequin, in connection with an over-payment to a construction company known as ICE Group. This, coupled with the existence of a new type of bankruptcy-postponement scheme under St Vincent and the Grenadines law that gives distressed companies there an alternative to liquidation, enabled Ames, with the help of others, to put together his scheme aimed at restoring Harlequin’s flagship Buccament Bay Resort “to full use for the benefit of Harlequin Property (SVG) investors”, who, under the scheme, he says would be handed ownership of the resort. He is understood to be HP (SVG)’s only shareholder. Harlequin investors, of which there are around 3,600, account for the majority of the entity’s creditors, according to Ames. In a statement this morning, Waterside Legal, which represents a number of the Harlequin Property investors, said it expected “updated voting forms” for the five Harlequin Property bankruptcy inspectors to be issued this week, and said it would be providing further guidance to its clients once it received the final list of candidates.